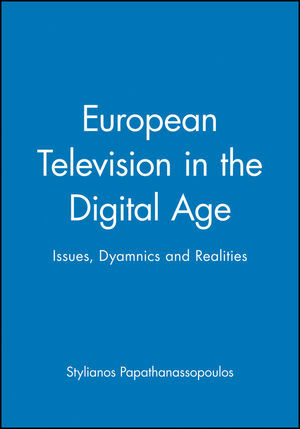 European Television in the Digital Age traces the development of digital television and provides a clear, concise account of the dynamics and realities of the changing face of television in Europe. The book synthesizes an array of empirical research and case study work, summarizes theoretical arguments, and provides an up-to-date analysis of the European audiovisual landscape. The author offers a timely appraisal of the key issues surrounding digital television in Europe today and outlines the likely future trends. Papathanassopoulos considers the problems associated with the new digital developments in Western Europe, the effects of the deregulation of European television, the economies of the new era and the issue of consolidation in the media industries. He also examines the future of public broadcasters, the role of the European Union and the impact of television in political communication. Special emphasis is given to the emergence and the effect of thematic channels, particularly on news, sports, music and children's programming. European Television in the Digital Age is an invaluable textbook for students on courses in media and communication, European studies and national policy studies. It will also be a useful source for researchers and professionals in the field. Introduction: European Television in the Digital Age. The Effects of Deregulation: An Overview. Going Digital: The Advent of Digital Television in Europe. Public Service Broadcasting in the Digital Age. The Funding of Television in the age of Digitalization. Media Concentration in the Age of Digital Television. Politics in the Television Age. Part II: European Television in the Twenty-first Century. From the General and National to the Particular and Local. More News and More News Channels. More Sports Channels: The Advent of Sports Channels in Europe. More Music Television Channels: Europe Dances to a New Rhythm. More Children’s Channels: The Fastest Growing Television Market in Europe. Conclusions: Television and its Viewers in the Internet Age.